Lisa Vanderpump is taking to her Bravo Blog to dish on this week's episode of The Real Housewives of Beverly Hills. 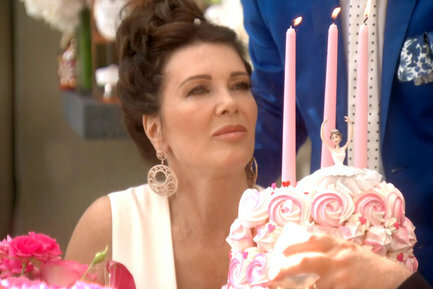 Lisa Vanderpump explains why she teased Dorit Kemsley at her party and why she now feels sorry about it. "Hello to all of you! I suppose I am guilty as charged, guilty of neglecting my commitment to blog, remiss in my endeavors to somewhat breakdown and decipher what inevitably transpires into a rather complicated scenario. And this season is no different. Camps are divided and emotions run high. There are subject matters that seem redundant. Time frames and choice of glassware seems rather trivial, but their triviality seems to have ignited a profound difference of opinion. What seemed initially to be a budding friendship between two women, Teddi and Dorit, two young women who bonded over their children, who had much in common, but are radically different in their handling of situations, just seemed to flounder. I found it rather disappointing to witness the steep decline that accelerated so rapidly. My more complex problems, regarding the frivolous lawsuit, that was emotionally draining and financially taxing, were the catalyst that changed the dynamic for weeks to come. I believe and hope that if a friend of mine were to leave in exasperation, after being kept waiting for...30 minutes, also that same friend then accused of conspiring with a third party, then told to be quiet and vaguely dismissed as my excitement didn’t warrant much conversation, that I wouldn't consider the subject matter of the glass of paramount importance. Hypothetically, if either Kyle or Dorit had left abruptly, I would have demonstrated a modicum of concern and made allowances. I would’ve questioned their hurried departure, but my friendship would have superseded the need and fervor of which my character was then picked apart. Accusations were rife. I left, because it wasn’t all about me, apparently, insinuating I am a self-obsessed individual. I apologized profusely at the beach for leaving. I had been under pressure, the day-to-day semantics of running a business, the rescue center that is coupled with many emotional components, the barbaric images that we were dealing with as we attempted to piece together a documentary about Yulin, were all components in my frustration. The straw that broke the camel's back were the unjust, unfounded accusations against my husband, the $500,000 lawsuit that was dismissed as the attorney general shut down the business that founded the lawsuit. Yes this camel's back was broken. And I...in my infinite naïveté expected a little more tolerance and support. Who is authentic in their frustration? Or is their frustration to call each other out a deflection from their own actions? Maybe a little regret? I hope so. Sometimes it is confusing as we view each episode, to remember that what we are watching as an audience is far more enlightening. I was blissfully unaware of the measure of negativity that was discussed after I left in a tizzy and also in New York as Dorit conveyed her thoughts to the others. Much vitriol has been hurled at Dorit, caustic remarks, much of it in defense of me and also a genuine disdain for her erratic actions. I hear you, but let me please tell you, there is so much more to this woman. I hope you will come to discover that. I don’t put the same stock in Dorit’s remarks as I do Kyle’s, not the same credence as Kyle. We have a history that has an understanding to protect each other as we started this journey together. I was disappointed in her. Dorit’s verbal diarrhea is somewhat watered down when it comes to importance. My repeated complaints to her have been that she doesn’t listen and often talks across people, but she has internally translated that as I have a need for her attention. I do have a need, and that need would be for her to take a breath! I know many good aspects of Dorit’s character—kind, supportive moments I have personally witnessed and appreciated over the past couple of years. Of course it stung to repeatedly hear, in almost competitive mode, which friend had spouted the most negativity. Well that has not been a picnic for sure. So the arrival in New York was potentially fraught with cataclysmic conversations. I was guarded in my reaction in the park with Dorit, but I ultimately tried to extract an accurate recant of the story, still mindful it was her night as the cover girl and aware that this could put a serious damper on her evening. Kyle seemed frustrated that I served no accountability to Dorit, but she hadn’t witnessed my conversation in the park, so that evening, I pretty much disengaged from any verbal altercation...and this is where it gets a trifle complicated. I didn’t hear what Kyle was saying to Dorit, after the cover party in the restaurant. I believed she was working through her own problems, regarding the beach house scenario, where Dorit had enlightened Erika that she was the subject matter the night previously. I had dealt with Dorit as I saw fit. I was playful with Erika and Lisa. Immersing myself in that argument would’ve been counter productive. I was absolutely resolute that Dorit should not leave alone, and I knew that PK would’ve expected me to accompany Dorit home, as would Ken. What followed was exhausting, the emotional seesaw, as I tried to reassure Kyle, chastise Dorit for her words, but ultimately I was in the eye of the storm that was predicated on how much crap my friends had spoken about me. It wasn’t a comfortable place to be. I met with Kyle at Villa Blanca and had to endure the normal diatribe about not apologizing. I had apologized to her on the beach for leaving but sincerely have no recollection of an apology for the negativity that ensued after I left. I wish my life was all about me LOL! After New York, when we reconvened at Camille’s house—which was lovely, and I am so happy for her—I definitely felt Dorit’s urgency to rekindle our relationship. Even though it was addressed with her straddling me in playful matter, I knew it was rife with serious undertones. But life and relationships of importance aren’t that easily severed—or repaired—for that matter. I definitely will let you know how I feel with a direct and often sarcastic or humorous slant, rather than a barrage of aggression. We all deal with things differently, and the fact is that on my birthday I was upfront with Dorit that our friendship had taken a sharp turn south but was not so devastating that it was irreparable. I playfully engaged regarding the glass and earrings in an attempt to bring levity and humor and hoped she would reciprocate, especially as she has been one, prior to this, who has initiated such antics. Maybe when there is more at stake there is a sensitivity that has been lacking previously, and it saddened me to see her hurt, as I do love her and believe she has honest regret. My feelings have been hurt. Teddi was right when she called that one, and it stung for sure. I don’t have a bevy of people kowtowing to me, ingratiating themselves into my favor as was intimated. I work hard and live an altruistic, yes sometimes maybe self indulgent, life, but it's coupled with humor and a love and loyalty to those close to me. I am not jealous of friends cultivating new friendships, and had been eager to introduce Dorit to my group. I don’t have enough hours in the day to be jealous. And so on that note, I bid you all a productive week. I will try to blog again soon, but my overwhelming writing commitments as editor have led me to be easily distracted." What do you think about LVP’s blog?